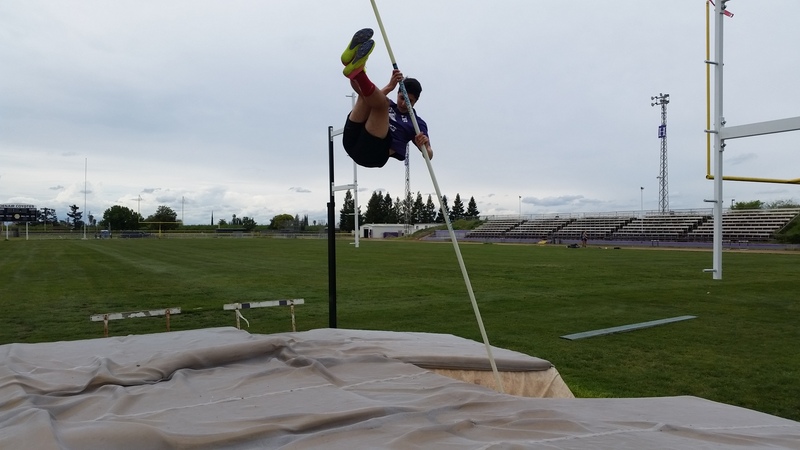 The return of the pole vault to the Denair High track team involves a pricy donation, a surprising discovery and a whole bunch of determination by three young athletes. Until this spring, Jim Wagner never has coached a pole vaulter in his decade with the Coyotes. But the seeds were planted last year when his friend Thad Moren, the track coach at Pitman High in Turlock, asked Wagner if he wanted an old pole vault pit the Pride was replacing. Wanger said, “Sure.” It was a $15,000 piece of equipment Denair otherwise never would have been able to afford. And it set in motion a series of events that led to the resurrection of the pole vault program this spring. The pit – a huge rectangular pad that allows vaulters to safely land on their backs from heights – is a must for the event. But there are other important pieces, costing about $3,000. The vaulters need a variety of fiberglass poles to use. There needs to be concrete foundations for the adjustable metal standards that hold the crossbar as well as a “box” for vaulters to plant their poles as they big their jumps. Wagner approached the sports boosters last fall to buy the equipment and help with installation. Some of the longtime supporters and members of the Denair maintenance staff recalled the pole vault had once been part of the team. What happened, they wondered, to the area at the east end of Jack Lytton Stadium where the event was contested? Assistant coach Ron Martinez and the maintenance staff started doing a little excavating earlier this year. Sure enough, they found the foundation of the old box and concrete pads buried under about 6 inches of grass and dirt. They couldn’t really safely use them, so Martinez – a firefighter in Oakland who lives in Denair and also has a construction background – poured new footings in early March. About two weeks later, Sergio Zavala, Logan Johnson and Shayln Gomes became the Coyotes’ first vaulters in more than a decade. 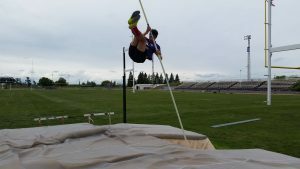 Wagner has no experience with pole vaulters, so he’s leaning on 2017 Denair grad Justin Gomes – Shayln’s older brother – to be a coach. Justin Gomes learned how to vault as a member of the track team just down the road at CSU Stanislaus. The Coyotes’ vaulters combine Gomes’ hands-on instruction with a steady diet of YouTube videos in which world-class vaulters explained and demonstrated the fundamentals. Straight arms. Turn speed into power and leverage. Strong shoulders and core muscles. Fearlessness. “I slow down the video to see how they do it,” said Zavala, a junior who also competes in the high jump, 100-meter dash and 4×100 relay. Last week at practice, Zavala was soaring over 8½ feet without really contorting his body. He was still going over the bar nearly feet first. With only two weeks of practice, none of the Coyotes has begun to master the difficult skill of bending the pole, pushing their feet over the heads, then spinning at the top and bending at the waist in preparation for the free fall down to land on their backs. Nothing about the pole vault is easy. That feeling was echoed by Shayln Gomes, a freshman who also competes in the high jump and long jump. “I like falling in the pit,” she said. In their very first competition Friday at a Southern League meet in Atwater, Gomes finished third while Zavala and Johnson tied for fifth. “It was a great entry point and learning experience,” complimented Wagner.